Less than half of Republicans think maintaining the free press is important to democracy. People protest outside of the Elizabeth Detention Center during a rally attended by immigrant residents and activists on February 23, 2017, in Elizabeth, New Jersey. Over 100 demonstrators chanted and held up signs outside of the center which is currently holding people awaiting deportation. The demonstrators, five of whom were arrested, denounced President Donald Trump and his deportation policies. Around the country stories of Immigration and Customs Enforcement (ICE) raids have sent fear through immigrant communities. 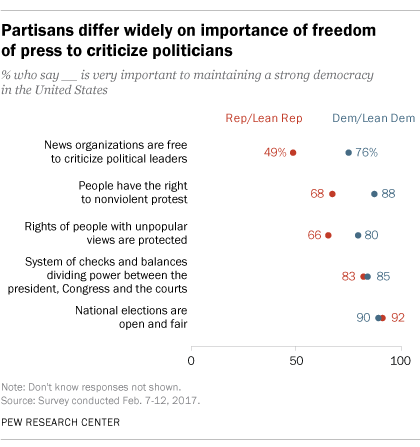 A new survey from Pew Research Center shows that when it comes to the importance of dissent and freedom of the press in a democracy, the nation is divided. Conducted the second week of February, the survey tapped 1,503 adults to determine how the current political climate impacts their views on issues long-held as tenets of American democracy. Here are three key takeaways. While Republicans and Democrats agree that there needs to be a system of checks of balances at the federal level, they diverge widely when it comes to the importance of nonviolent protest to encourage those checks. Fully 88 percent of Dems believe it is key to a strong democracy, while just 68 percent of GOP-leaning respondents agree. That gulf grows larger when it comes to the press, which President Donald Trump has called the “enemy of the American people.” Less than half (49 percent) of people affiliated with his party feel that news organizations should be free to criticize political leaders for the nation’s sake. Three-quarters (76 percent) of Dems think that pushback is key. Perhaps predictably, the election prompted a partisan shift in how people view the risks of increased presidential power. 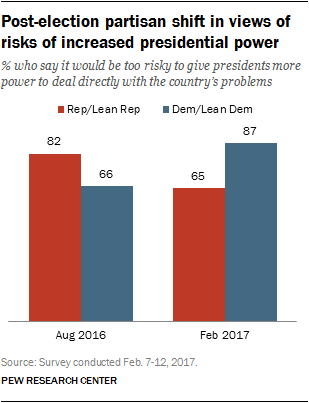 Pre-election, 82 percent of Republicans thought it was “too risky” to give presidents more power. That percentage dropped to 65 percent after Trump took office. Democrats also flip-flopped on this issue.